With Readly you can read Bass Guitar Presents and thousands of other magazines on your tablet and smartphone. Get access to all with just one subscription. New releases and back issues – all included. 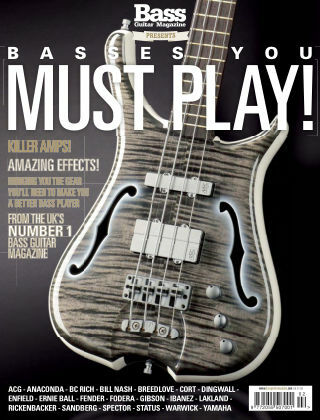 Basses You Must Play, collates a ton of reviews of desirable bass guitars from the BGM archives as part of our magazine’s ongoing mission to make you a better bass player. Whether it’s an £11,000 Fodera you’re after – and why not? – or a bass which you can snap up for a mere few hundred quid, this is your one-stop shop for all things bass-related, and the perfect companion for our first special edition, BGM Presents... The Essential Bass Guide, published last year. Oh, and we’ve thrown in reviews of cool amps and effects pedals too, just to round off the package. Bookended by a foreword and afterword from the great Stuart Hamm and Dave Swift, this publication will take you a long way towards your goal.